HAVE you been down to see Northampton’s new marina then? Dougie, Bonnie and I got on our bikes at the weekend to go any have a proper look at the project at Becket’s Park, which has cost £2.4million. We may be as far from the sea as it’s possible to be, but we sit on a junction of Britain’s inland waterways. Getting out on a bike is an interesting way to see parts of your area you may not even realise exist. I’d like to claim we bike everywhere but in truth it’s usually a guilty whizz around the all-too familiar Racecourse for us. This time I plonked Bonnie into the bike seat and persuaded 12-year-old Doug to cycle further than school, and it was worth the tired legs. While the new marina area, or mooring basin, doesn’t yet look anything like the artist’s impression I keep seeing associated with the project, it’s certainly a vast improvement. The pathways that now run from Midsummer Meadow along the River Nene/Grand Union canal show the potential for the waterways to be a real asset to the town. And a nosy down along the public footpath behind Avon and the old shell of the power station was a real eye-opener – it’s a vast, neglected mess, and you can see why the planners want to develop it. We returned along the river right through town, avoiding all the traffic on the wide waterside pathways that run all the way behind Morrisons and on behind Carlsberg, right through to the train station and via the road back to Semilong. All the way Bonnie was shouting at ducks and geese and the poor people of Northampton going about their business: “Poo! What’s that smell?” was her shout, mainly as we passed the venting brewery. 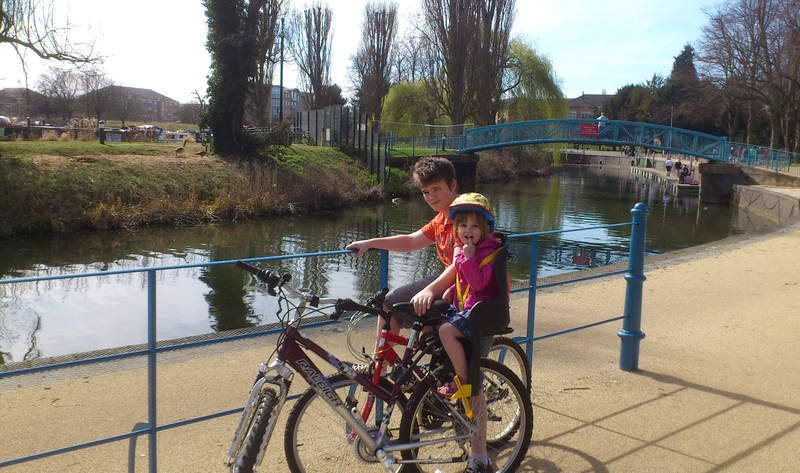 If you’re like me and tend to steer your cycling children away from the busy roads onto traffic-free familiar territory such as your local park, it’s certainly worth going a little further afield and trying out the river route. Who knows, if enough people use it then they may even get around to clearing back the rubbish and the overgrown pathways too. That smell is the Carlsberg Smell, it’s very sad that right in the middle of the town all you get a smell like that, this is one of the reasons why northampton looks smelly, dirty, old and rugged.